If you haven't heard of Richard Ward you're missing out big time. He's a hairdresser well known for he's extensive celebrity clientele and has titillated the locks of many a A list star like, Liz Hurley, Kim Cattrall, Lily Allen and even royalty with Kate Middleton being on he's books. So it's no surprise that he has bought out he's own hair care line to be used in he's award winning salons and now available on the high street for us to use. 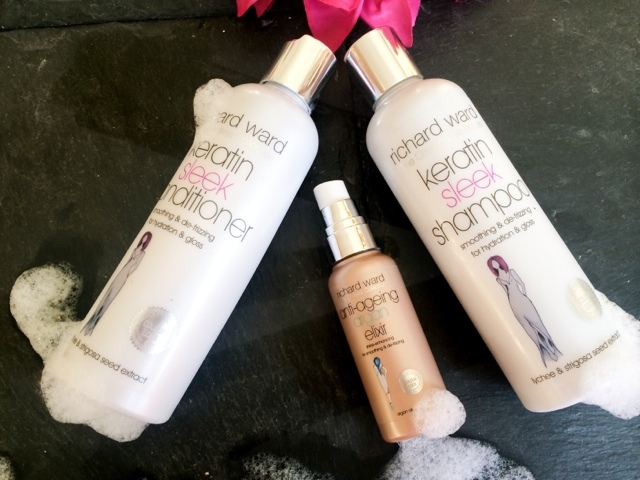 The products I have here to try out come from the Chelsea Collection, the Keratin Sleek Shampoo and Keratin Sleek Conditioner. Both items contain Keratin, a natural protein found in hair (and nails) which helps to strengthen the hair by re-building broken fibres. It also contains Strigosa Seed and Lycee which adds hydration and acts as a smoothing agent to make hair appear more sleek and frizz free. The shampoo and conditioner are both very nice to use and have a pleasant scent. the shampoo cleanses the hair removing build up and dirt with ease without stripping or drying it out. The conditioner feels like a concentrated milk that doesn't weigh my fine hair down. Some "smoothing" conditioners tend to coat the hair to reveal a more sleek appearance and this can make hair greasy and limp, but this does not. What makes these all the better is with the addition of a colour lock and heat protective formula which means you don't have to apply more products to your hair in order to protect it and increase the life of the colour. For someone like me with fine hair that tends to not bode well with lots of products being used on it this is something that interest me. 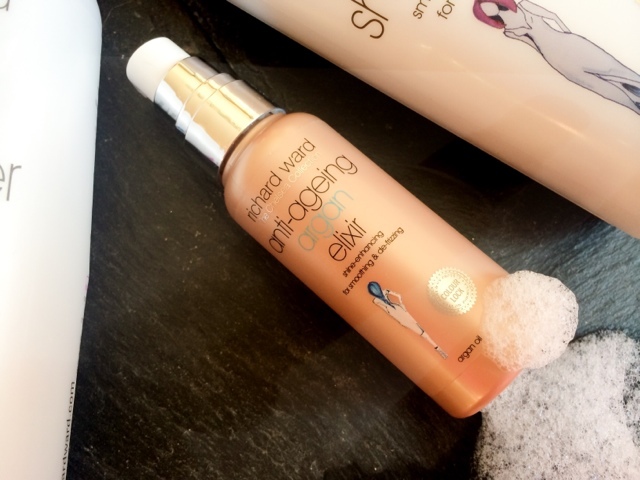 The Anti-Ageing Argan Elixir also contain the colour and heat protecting properties as well as the obvious Argan Oil - which seems to be the hero product of the moment right now. And there's no denying the magical wonders that is does, I for one have been Argan products for a few years and love everything about them. This is no different in the fact that the Argan helps smooth and restore dry damaged hair giving it a more sleek and healthy appearance. I mentioned my love for this in my "fake healthy hair" post as it's nourishing without being overly oily, and is great when used on thick course hair after styling to smooth and tame frizz (finer hair types may want to use it sparingly on dry hair). I use this on wet hair after every wash, concentrating on the mid-lengths and ends, and then just putting what's ever left on my hand through the top section and roots. All Richard Ward hair care products can be picked up in your local Waitrose, containing a variety of formula's to treat different hair types and concerns. 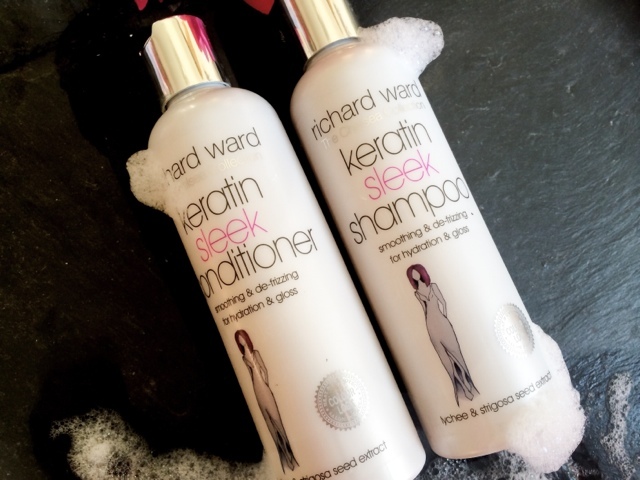 Have you tried any products from the Richard Ward range?